When I told my friends and associates Gloria Steinem would be coming to Rochester for the Planned Parenthood of the Rochester/Syracuse Region annual fall luncheon, I was expecting shrieks and shouts. I mean, this is Gloria Steinem— famed feminist, fierce social and political activist, renowned author and Ms. magazine co-founder. She was a key leader in the women’s liberation movement of the late 60s and 70s and continues to be a strong voice in politics and the media today. Gloria Steinem! Gloria! Steinem! But there were no shrieks. Definitely no shouts. Mostly, I got “oh, cool” or “who?” I realized I was far removed from the “Women’s Studies bubble” of my college and grad school days. Could it be that my fellow young professionals couldn’t connect with an icon of the feminist movement? Couldn’t connect with that generation? For me, the work done by leaders like Gloria Steinem doesn’t seem so far removed— there’s still health care challenges to face on the national level (more and more every day); there’s still inequality and economic and social discrimination; there’s still international injustices and suffering. There’s still so much to do. 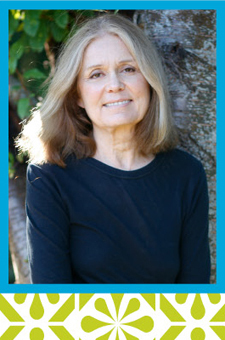 Having the opportunity to hear Gloria Steinem speak during this shifting climate is incredible – to hear her perspective, shaped by her revolutionary past and progressive present, is a once-in-a-lifetime chance for many of us. A chance I hope you don’t miss out on. Even if you have to Google her first. This entry was posted in Announcements, Community, Guest Blogger and tagged @KaitlinGray, #Event, #GloriaSteinem, #guestblogger, #PlannedParenthood. Bookmark the permalink.